Kinerma is an ancient Karelian village situated 100 km from Petrozavodsk. The village famous both for ancient wooden houses erected according to the traditions of Russian wooden architecture, and for hospitality and friendliness of Nadezhda, local resident of Kinerma. She did not only win several grants for the restoration of ancient houses, but also preserves the village in a traditional Karelian style. 09:00 Meeting with the guide. Departure for Kinerma Village. 11:00 Arrival at Kinerma. 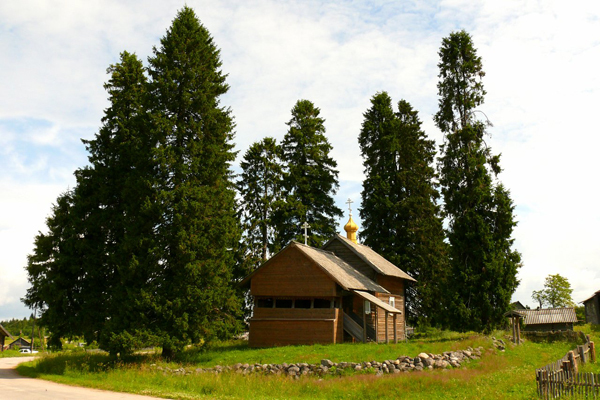 Nadezhda will meet us and show the main sights of the village, which are houses of the end of the 19th century and the wooden chapel of Virgin Mary of Smolensk errected in the 17th century. After the excursion around the village Nadezhda will invite you to her house to bake kalitki, national pies made of rye flour with different fillings. 13:00 Lunch in the village with dishes of Karelian cuisine.